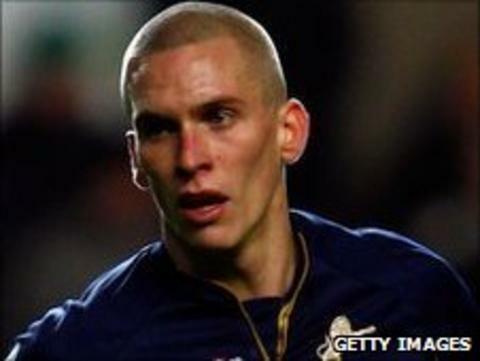 Norwich City have signed Millwall striker Steve Morison for an undisclosed sum. The Wales international joins the Canaries, newly promoted to the Premier League, on a three-year contract. The 27-year-old signed for the Lions from Stevenage in the summer of 2009 and notched 17 goals in 43 games in the Championship last season. "It is a fantastic club with a fantastic fan base," Morison told BBC Radio Norfolk. "With them being in the Premier League as well it all fits together perfectly for me personally." Morison handed in a transfer request last week which was rejected by Millwall. He is set to make the leap from playing non-league football, with Stevenage and Bishop's Stortford, to the Premier League within two years. "I've played in seven leagues, from the Ryman Premier to hopefully, if I get a game next year, in the Premier League," he added. "It's down to a bit of hard work, its had it's ups and downs but it's the best league in the world and where every single football player in the world wants to be." Morison, who has been on Nations Cup duty with Wales, netted 40 times in his two campaigns at Millwall and still had two years to run on his deal at the Den. Norwich have already signed Everton striker James Vaughan after winning promotion to the Premier League, and now have plenty of competition among the forward positions with Grant Holt, Simeon Jackson and Chris Martin all used regularly in the 2010/11 campaign. Boss Paul Lambert said: "There's only so many times you'll get away with only having three or four lads in that department. "The amount of games you have to play and the intensity of the games we're certainly going to need a strong squad. "Steve can lead the line very well, he's done it with Wales and Millwall, he's going to be great for this football club."